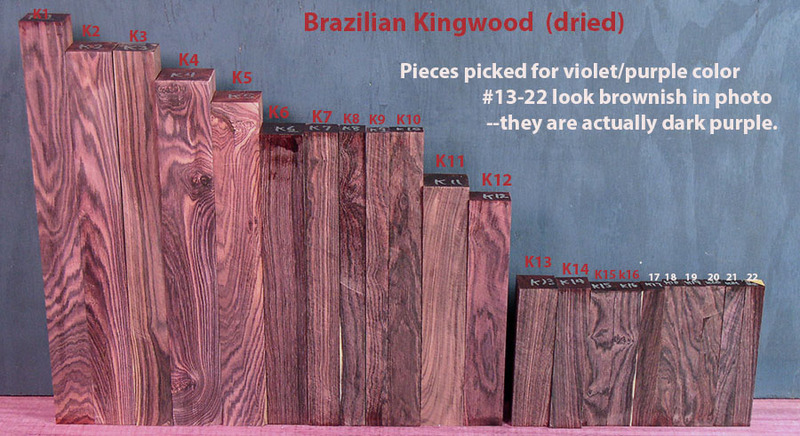 Brazilian Kingwood is a beautiful member of the rosewood family. 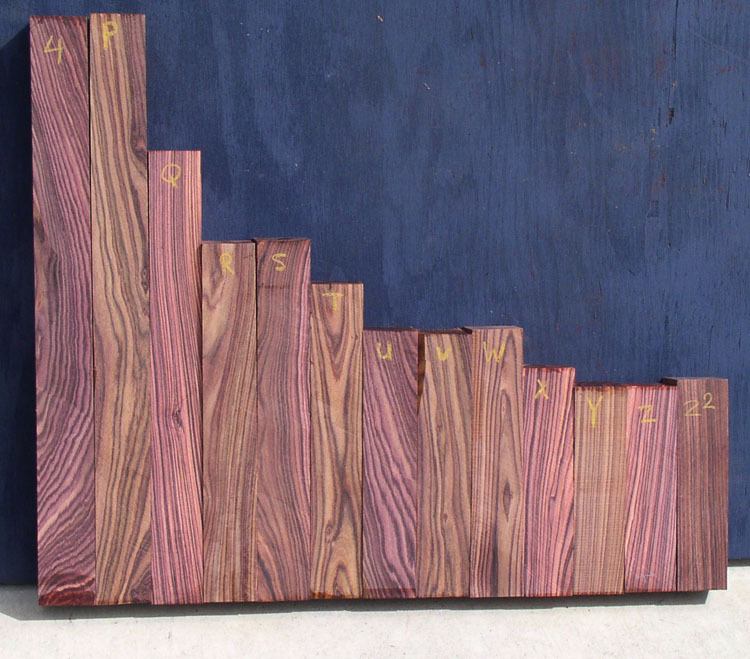 The unfinished color of the wood usually has a violet hue. 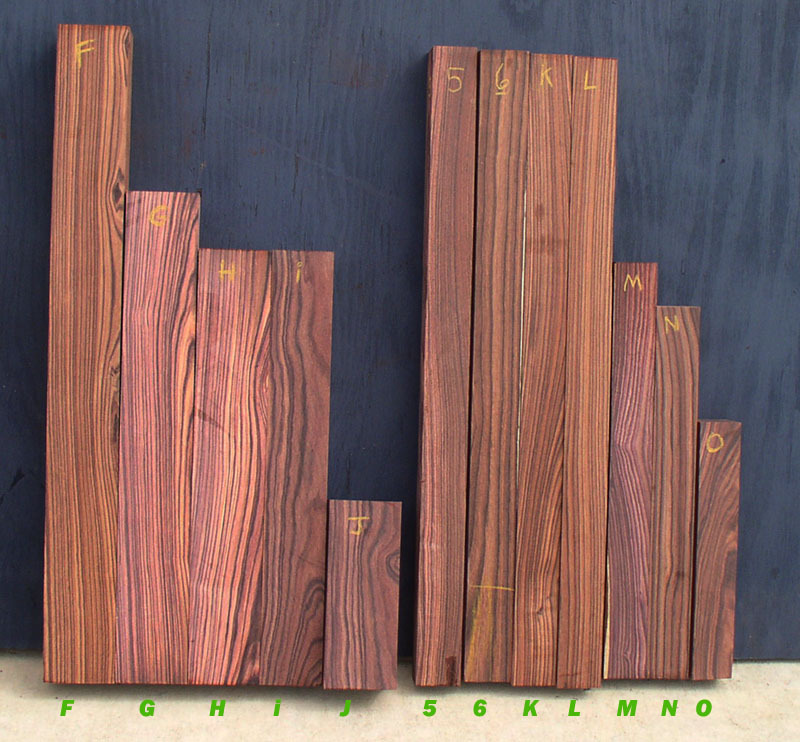 This wood can be beautifully finished and is an excellent turning wood. 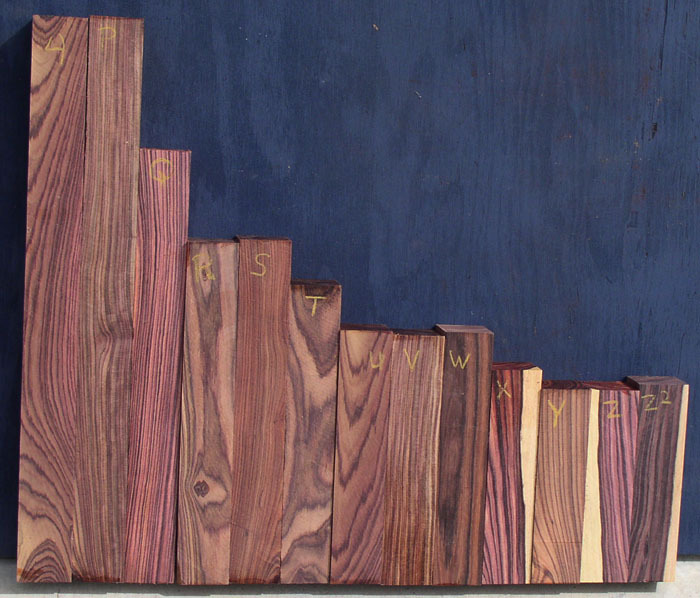 The specific gravity is between .8 and 1.2, making it a very dense wood. 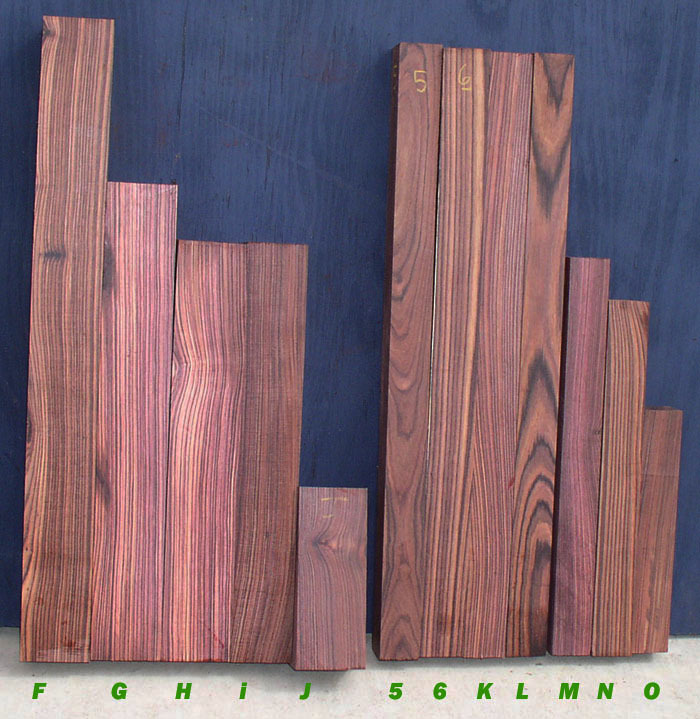 We have realized that this wood is becoming very rare and further importation is not possible for now. 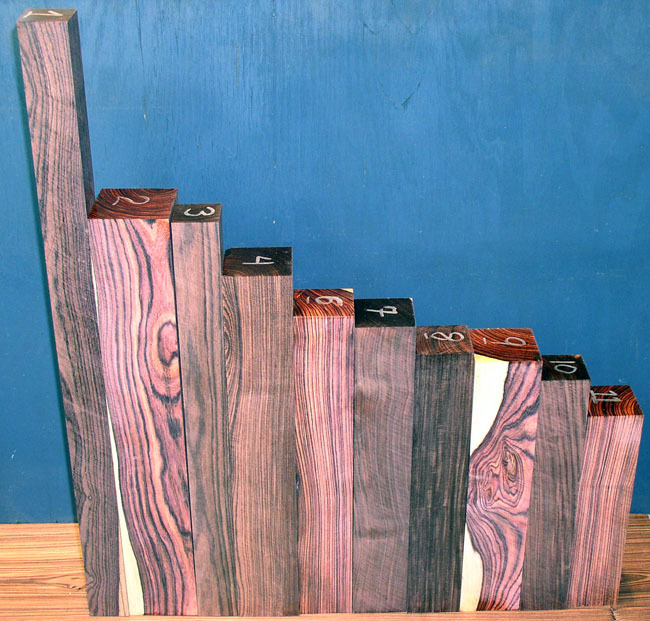 Pieces over pen blank size are becoming very expensive and in many cases impossible to find in high quality like the ones on this page. 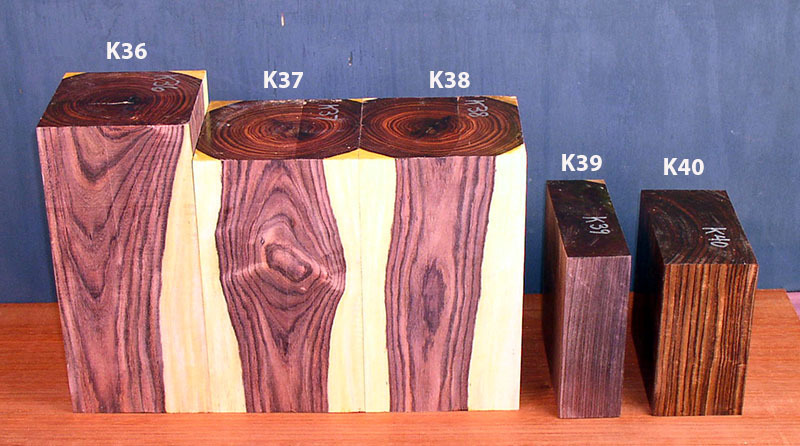 We can only achieve these results because in the past we purchased some kingwood logs, dried them and cut these perfect pieces around the extensive cracking in all logs. Actual pieces shown, Click photo for second view. NOTES: DRIED high quality pieces. There is no piece 5. Piece 7 has some figure. Piece 8 has a dark patina but is not that dark on the inside, (see top of piece in pics to get idea of color inside). If your piece is missing below or you get an out of stock notice in the shopping cart it is sold. Actual pieces shown, Click photo for second view. 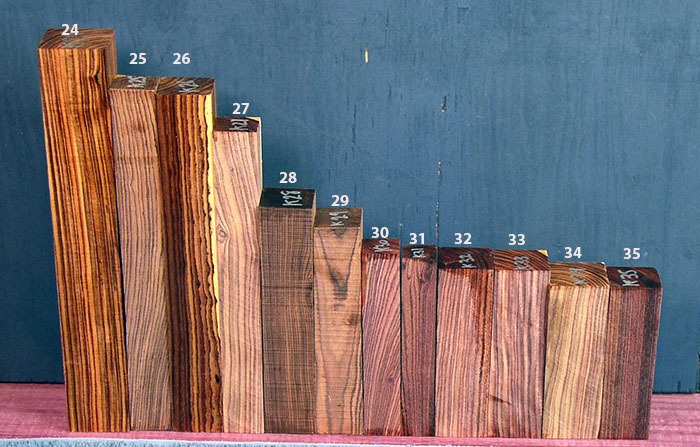 NO EXPORTS NOTES: DRIED high quality pieces. These are highly selective pieces. Selected for violet colors and interesting grain. 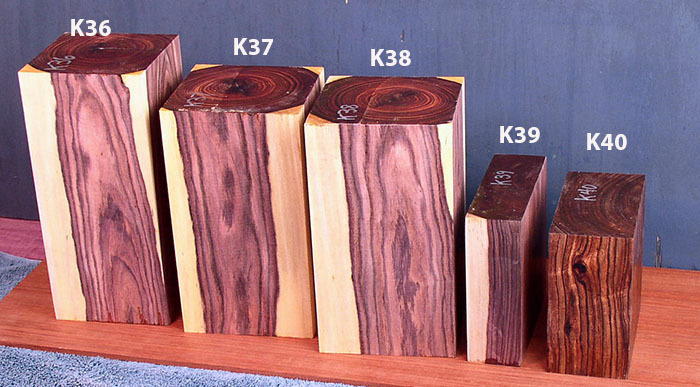 K4 has a few burl clusters. 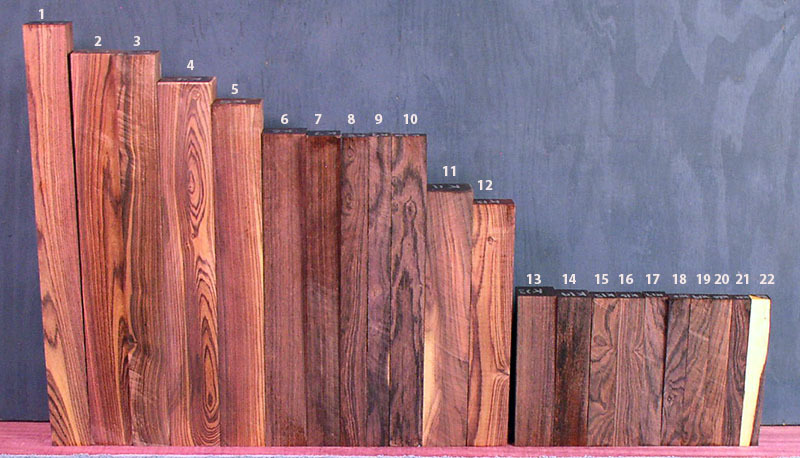 All are dense, but 6 and 7-10 and 13- 22 came from an unusual log with extremely fine grain and unusually high density. 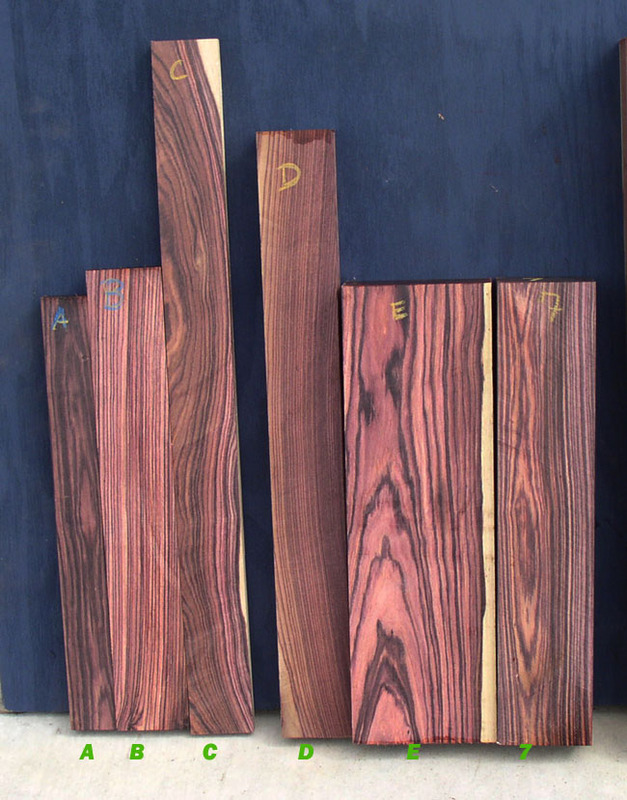 They are a very deep purple rather then the brownish appearance they have in the photo. 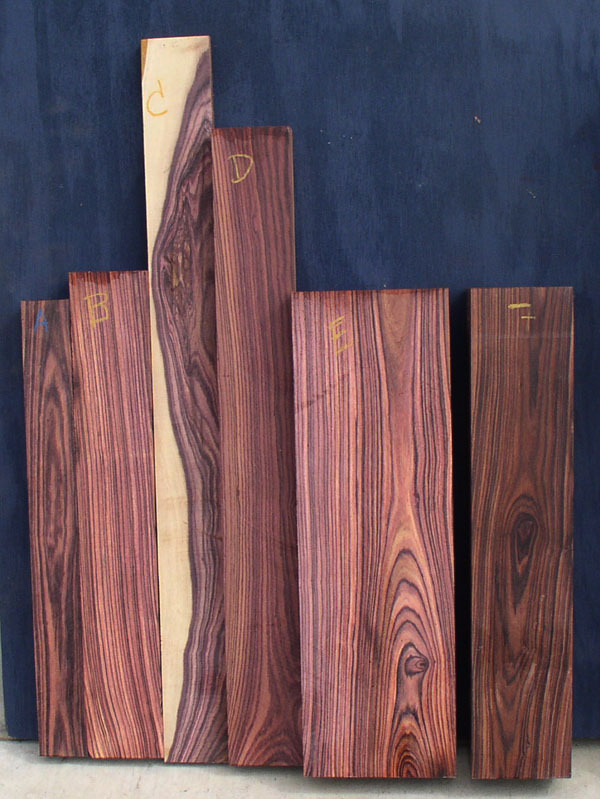 Those particular pieces are the most glass-like when finished of any Kingwood I have ever had the pleasure of working with. 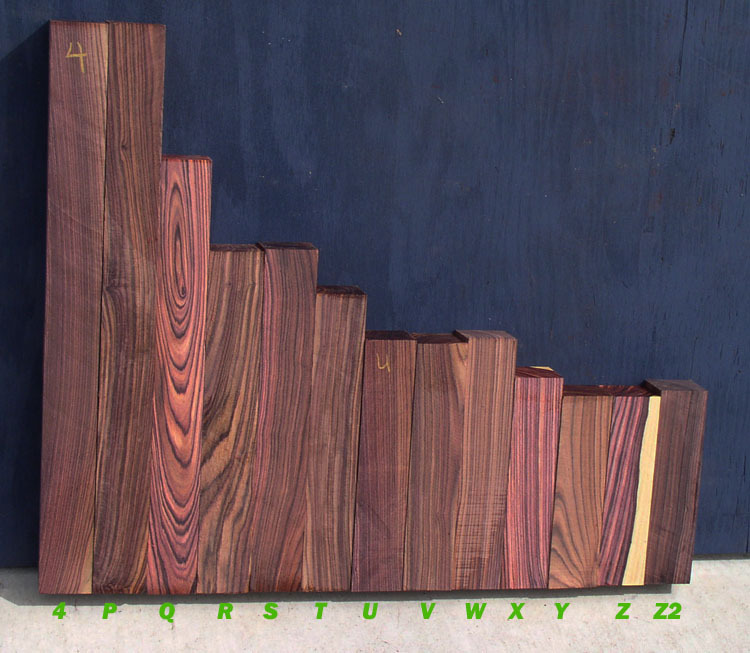 If your piece is missing below or you get a red out of stock notice in the shopping cart, that one is sold. NOTES: DRIED pieces. 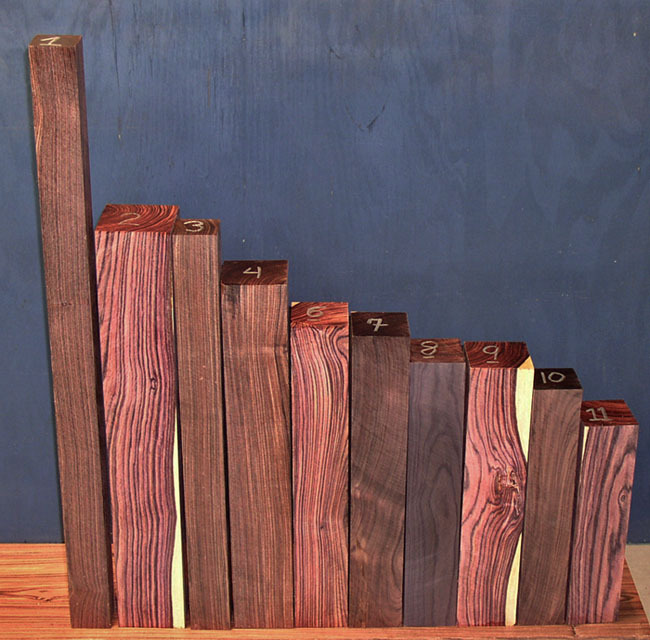 The huge vase blanks below have a dry weight of 9-10 pounds. 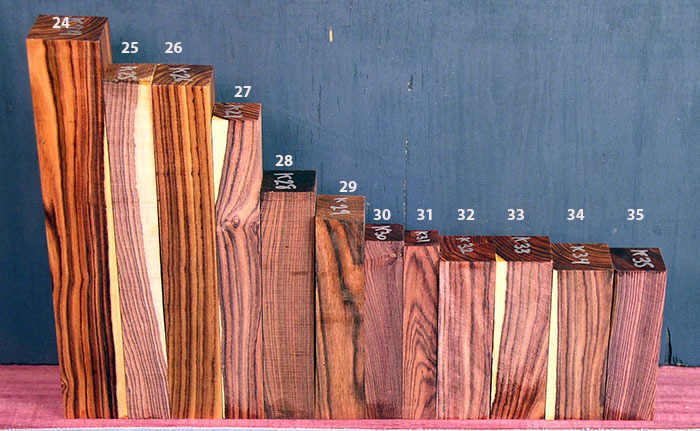 They are square cut logs specially selected to have the smallest pith checks possible. Normally you would put superglue in the pith checks to keep them strong during turning. We have already put some thin superglue in those pith checks to make them more stable. A rare offering. 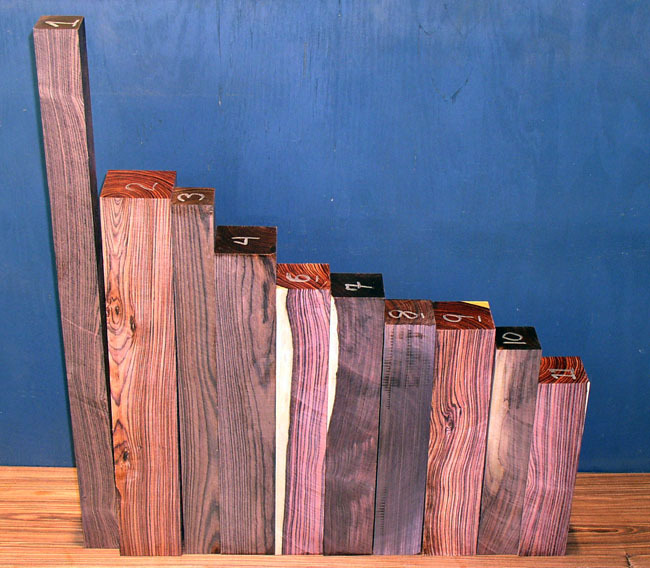 The bowl blanks, K39 was the best purple out of about 30 blanks we got a number of years ago, and I've seen few like it before, if any. 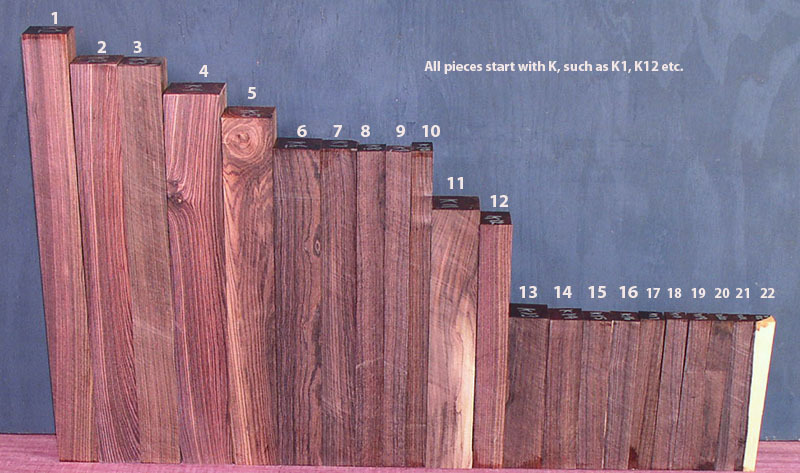 Piece K 40 was stabilized with pentacryl about 8 years ago. 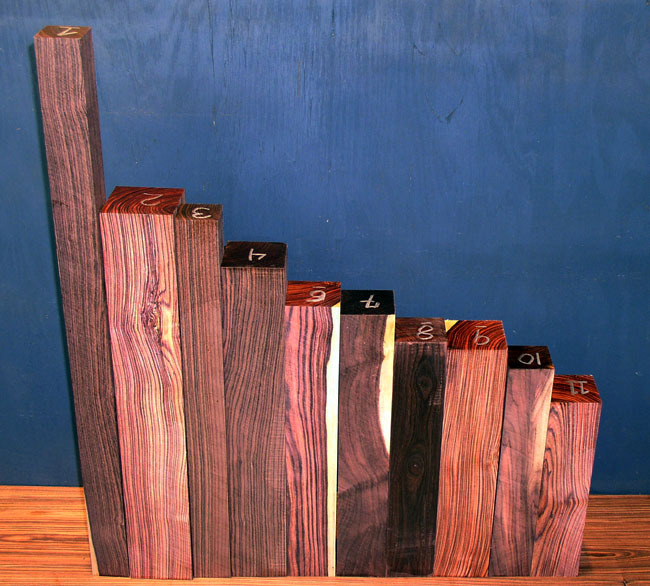 It does not smell like pentacryl anymore and while it is usually suggested to wipe down pentacryl treated wood with denatured alcohol before finishing, we did not do that and the finish stuck just fine. NOTES: DRIED high quality pieces. There is no piece 5. Piece 7 has some figure. Piece 8 has a dark patina but is not that dark on the inside, (see top of piece in pics to get idea of color inside). 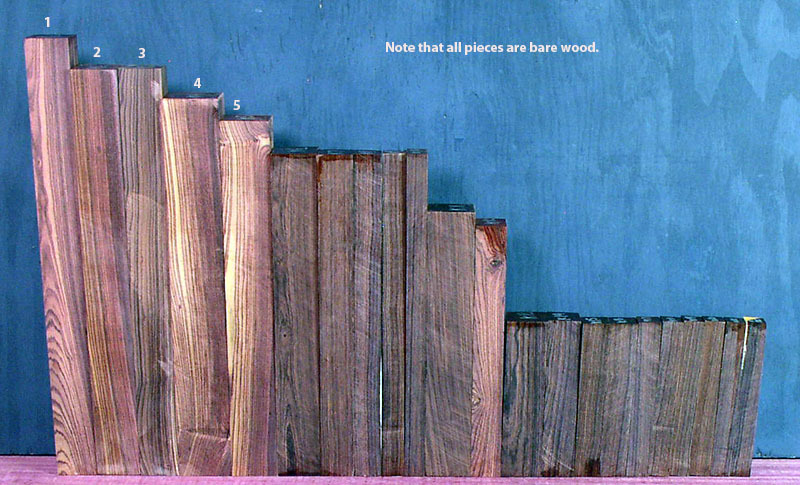 Piece 9 has a burl area. 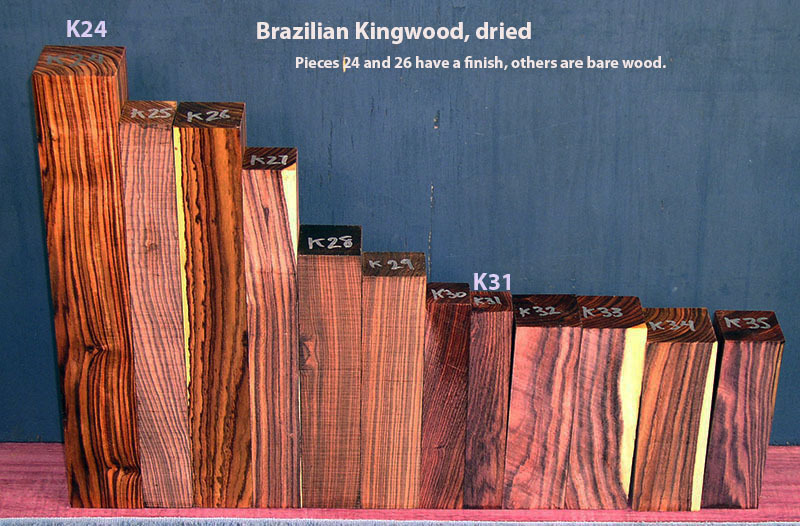 SMALL BRAZILIAN KINGWOOD BOARDS: Actual pieces shown, Click photo for second view. 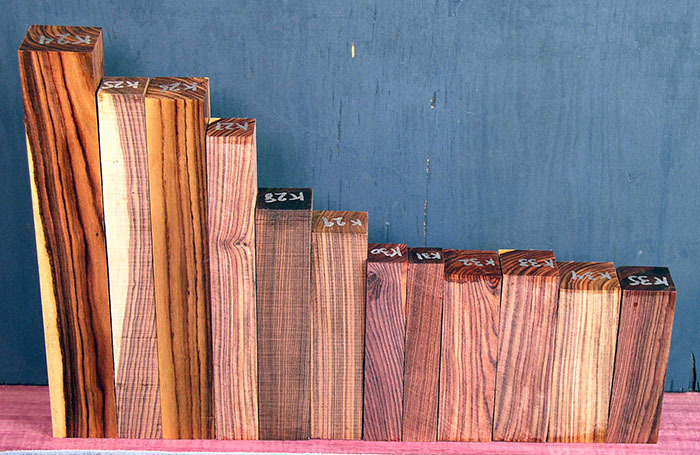 NO EXPORTS NOTES: DRIED high quality pieces. Actual pieces shown, Click photo for second view. 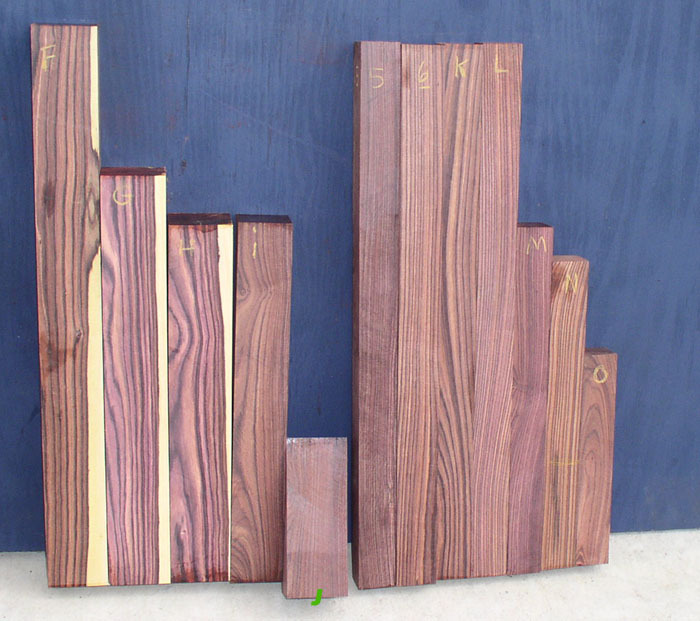 Like tulipwood, this rare rosewood can no longer be exported from Brazil, in addition we also cannot export it from the USA due to new CITES rules. NO EXPORTS NOTES: DRIED high quality pieces. If your piece is missing below or you get a red out of stock notice in the shopping cart, that one is sold. 3/17 NOTE: PIECES BELOW WON'T BE TAKEN OFF THE SITE UNTIL MARCH 22. BEFORE THAT PUT THEM IN THE SHOPPING CART TO SEE IF THEY ARE AVAILABLE as they will show below even if sold. 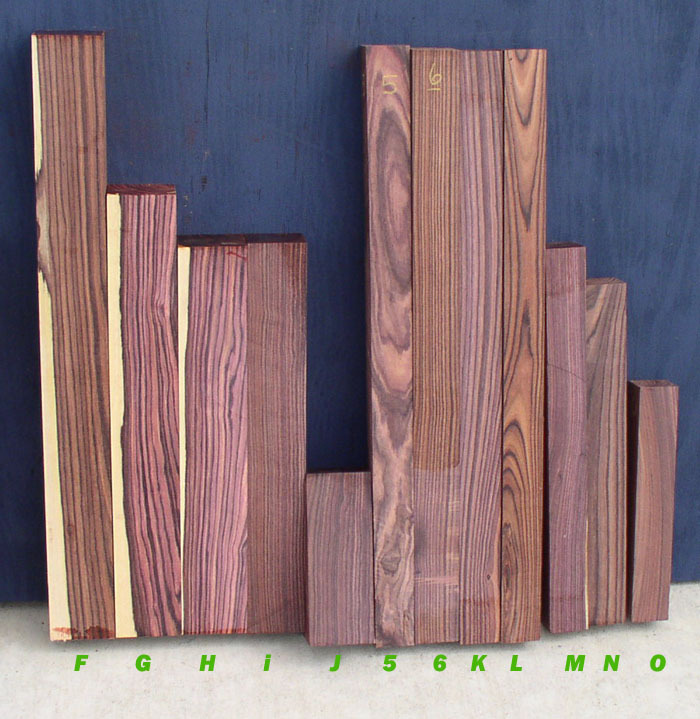 Actual pieces shown, Click photo for second view. NO EXPORTS NOTES: DRIED high quality pieces. 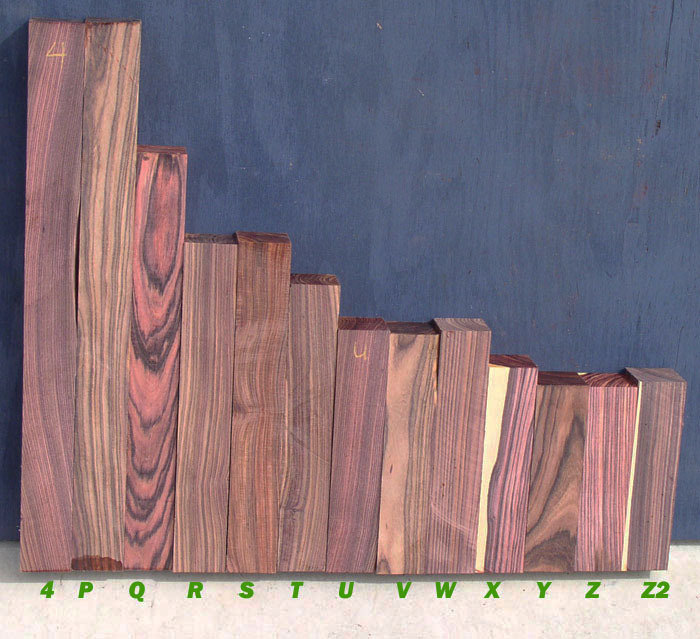 Piece 4 has rounded corner shown in photo 1.